Rey was motivated by a desire for purpose. She thought finding her parents would give her purpose. But she learned that purpose isn’t something that’s given to you, it’s something you create for yourself. Like ben telling luke his dad waa dead , doh. Unless you mean obi won was bad ? Stop trying to make everything black and white , there is gray everywhere. Even in luke. And just because he sensed the good in vader and didnt in kylo should tell yall something. Oliver Twist (one of the greatest orphan movies ever told) didn't question where he was from. He was an orphan and accepted it - just turned out at the end he wasn't an orphan and was an heir to a rich family. 3rd movie - ends the story and the audience gets to see how all the information they have been given in the first 2 movies plays out. Johnson has said this time and time again - he made a movie for himself, it was very much a personal movie for him and worked on TLJ with blinders on, purposefully ignoring what the audience wants and what TFA had set up for him. He also went on to say (in an earlier statement) that he thinks the best movie a director can make is when 50% of the audience loves your movie and 50% hate it. He says it creates debate and interest in the movie. This is fine for a starting director to do in a stand alone, proposed cult following type movie - like Napoleon Dynamite or something - but to do this in the middle of a star wars trilogy is just wrong. Kennedy should have seen this. It was her job to make star wars successful and make lots of money for Disney that just spent $4.5B on the franchise - not shatter the fanbase. It is all her fault as much as it is the Man-Baby Johnson's. You all have such short memories , empire left as many questions or more than hope. Its the grass in greener syndrome , everything older was better. Oh well no pleasing some ppl. If they had done everything yall say , you would complain about that , how unoriginal, cant they come up with something new. What? Where on Earth did you get this? Vader told Luke the truth - the biggest reveal in movie history. Fans were all like ****!!!! but he told the truth. ROTJ again was the third installment how the story ended with all answers in previous movies met. You have a short memory indeed if you cannot remember correctly what I posted. this was also true for the Matrix trilogy (not a perfect trilogy by any means) but the 2nd movie revealed Neo was not important at all - just an anomaly the system created in trying to correct itself and he is trying to break the mold in the 3rd act. Actually, if Abrams does not expand upon Johnson's reveal of Rey's parents - that is all Rey is as well. An anomaly created by the force to balance itself against the likes of Kylo Ren. Without the force deciding it needed a champion to do so, Rey is nothing. She has not earned her power at all - it was just the will of the force. Which I still think is lame. Yes, you don't get it. That's ok. It will come in time. God i hope not , i hope they dont make this as bad as the matrix or as predictable as y'all want it to be. I'm not, that was what Lucas was told by child psychologists. Let's tone it down folks, people have different takes on the trilogies and what makes 'em bad and/or good, so let's just be mindful of how we talk to each other about our differences of opinions. I never said the Matrix trilogy was good - all said was that it adhered to basic story writing where a trilogy of a continuing story is involved. The Star Wars sequel trilogy is clearly (and as a matter of fact, because it has been stated) are making it up as they go along - Ruin Johnson had creative control over TLJ, it was his personal star wars movie - so my wants, like many people who are upset with TLJ, outweigh a selfish manbaby director's childish desires at destroying a franchise. Don't get me wrong - I am hopeful JJ can turn it around, but realistically, I am not sure he can. JJ is going to bring back jar jar and save the trilogy! He has publically said he sees nothing needing fixing. He was the Executive Producer for TLJ. What if JJ was Jar Jar? Do you have proof he isn't? I've never seen both in the same room at the same time, and I would like to think I'm smarter than the average Batman/ Superman side character. Rey doesn't have to be related to anyone. We need a jedi that isn't related to a previous jedi. * Anakin was born from the force itself. He is like Jesus if the Force is like God - that explains why he is the most powerful force user in the galaxy...ever! (side note: he never reaches full potential re: knowledge of force as well as crippling suit - but raw power is there). * Rey comes along and is more powerful than Kylo or at the very least his equal (although she has beaten him multiple times already). * Anakin himself spent years training under Jedi and Sith. Luke trained for a long time with Kenobi and Yoda collectively as well as refining what he had learned. They both had several failings, such as losing duels and limbs. * Rey has no training and no failings and never loses at anything. She is proficient and powerful for the sake of being proficient and powerful. * If Rey is the force's answer to balance the light in contrast with her "equal" in the dark (Kylo) then the force has the ability to directly balance itself - therefore: What was the point of the prophecy of the chsen one and Anakin being able to balance the force??? The only true way we could have had a Jedi hero not being related to the skywalkers and create a whole new story is if the skywalker bloodline ends and new force users arise - then the playing field is reset. But this has not happened. At the very least new Jedi or force users should require some form of training, rather than just being overly powerful etc for the sake of it. The character of Rey has many issues, but I fail to see how her strength in the force is “lore breaking”. None of those statements you made dictates that anybody who is a strong Jedi needs to come from some lineage of other strong Jedi. Star Wars has always had the plot device of “person has lots of innate strength and struggles to control it”. I don’t see why that is suddenly some lore breaking issue. I’d like to point out that people seem to think that Rey easily kicked Kylo’s rear at the end of TFA, which is far from the truth. Go back and watch it. Yes, she manages to survive and eventually cut him a bit, but most of the time she’s running away in fear. Kylo loses because he underestimates her, a point that’s driven home in TLJ. You have missed the point then dear friend. I am not saying a strong force user cannot come from anywhere - indeed force users such as Palpatine, Yoda, Windu & Kenobi came from somewhere of obviously little genetic importance. My point is that when the Force created Anakin - the personified version of the force with a power never charted before in any force user - he genetic code and bloodline are paramount. I am saying Rey being a powerful jedi is possible, but compared to that bloodline it just isn't. So there lies the issue. The only logical loophole to this (I believe I mentioned to you before, long before TLJ was released) is that Rey's power is at a level only because the force itself wills it so. According to Snoke, the light rises to meet the dark, as Kylo's power grew his equal in the light would as well. This is indicative of the force balancing itself - which brings me back to the point of Anakin in the first place - his entire being only existed to balance the force. If the force can balance itself, it makes the whole creation of Anakin pointless and therefore undermines the entire PT as well as the OT. Hence this "loophole" is also lore breaking. I think I understand what you mean (according to some arbitrary prophecy we know nothing about, anakin is the most powerful force user ever so if his injured, erratic, and cocky grandson is bested by someone unrelated, then Rian Johnson is a monster, got it), but all I can say is that you’re taking some nitpicky lore things way too seriously. Star Wars has always been one of the most inconsistent fictional universes and complaining about a minor discrepancy between two films made almost two decades apart is pretty pointless. 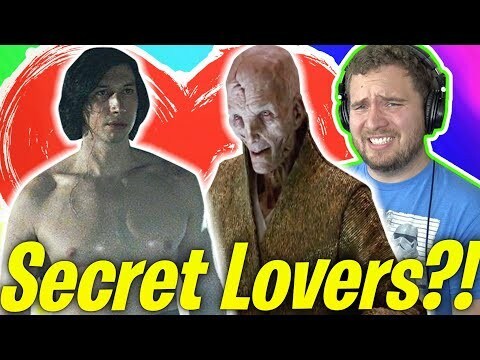 If that kind of stuff is what matters to you the most, you should be roasting the prequels instead of the ST.
For me, the quality of Rey and Kylo’s characters and their relationship supercedes any obligations for consistency with a terrible, cliche, underdeveloped plot device in an equally terrible film from 1999. Calm down (Rian is a monster for many reasons, lol). I wouldn't say the lore is has been one of the most inconsistent fictional universes - except since TLJ came along that is. It was hyped up and stated that Anakin/Vader was all powerful and therefore his 2 children alone had the power and only hope at restoring peace to the galaxy. Following that logic - anyone can pick up a lightsaber, without any training, and best a Skywalker time and time again just because? No point you have made argues against that very lore breaking notion.